Enjoy a lively three-day weekend of contemporary and classical flamenco when the Aga Khan Museum auditorium becomes the venue for our third annual international Flamenco Festival. Through performances and film, experience the soulful expression and contagious energy of emerging and established, local and international flamenco artists. This double bill includes Toronto-based Compañia Carmen Romero, who delight audiences with their high-energy performances. Adrián Santana began training with his uncle, Pepito Vergas, the legendary flamenco dancer from Malaga, and continued his dance studies at the Professional Dance Conservatory of Malaga. He participated in Flamenco Festival USA’s Dressed to Dance project presented at the Guggenheim Museum in New York City. Symbiosis, Santana’s most recent work, premiered in Granada at the Corral del Carbon in 2014 and was subsequently performed at the IV Malaga Flamenco Biennial and the 2017 Albuquerque Flamenco Festival. In addition to his work as a dancer, he teaches in conservatories and academies in Spain and abroad. Compañia Carmen Romero is a Toronto-based school of flamenco dance arts. 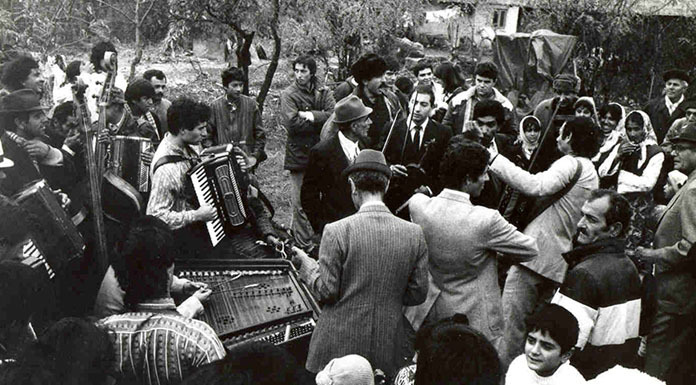 Founder and solo artist Carmen Romero leads a collective of dancers, musicians, and singers. Tony Gatlif is a French film director of Romany descent who works as a screenwriter, composer, actor, and producer. Born in Algeria, he has made several feature films with autobiographical themes about cultures bound by music and dance. Pablo Giménez, who thrilled audiences at the Aga Khan Museum during his 2016 performance Two View of the Alhambra, returns to play flamenco guitar steeped in the classical traditions of Granada. 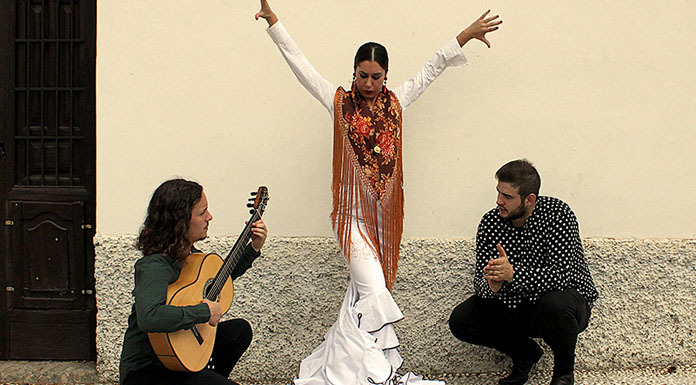 Joven y Jondo means Young and Deep and, during this performance, Giménez is joined by two young flamenco artists, dancer Victoria Macias and singer Alejandro Luján. The product of a rich heritage and years of study, these artists prove flamenco music and dance are in capable hands with a new generation. Also this afternoon, members of the Toronto-based group Esmeralda Enrique Spanish Dance Company in a performance that embodies the essence of flamenco. Pablo Giménez is the son of acclaimed classical and flamenco guitarist Juan Miguel Giménez. He began his formal studies at the age of eight and concluded his professional training in classical guitar at the Royal Conservatory of Music Victoria Eugenia in Granada. He is currently completing his professional training in flamenco guitar at the Rafael Orozco Conservatory in Cordoba. This prestigious flamenco guitar program accepts only a handful of new students annually. He has performed as a solo guitarist at venues and festivals such as the Lincoln Center, the Boston GuitarFest, and the Andres Segovia Classical Guitar Competition. He was the featured guitarist in the documentary film Instrumental Places: The Granada Guitar. Victoria Macias completed her professional training in Spanish Dance and Flamenco at the Reina Sofía Conservatory in Granada and Carmen Amaya Conservatory in Madrid. She began her professional dance career at 12, when she joined the Maite Galán Spanish Dance Company. She has toured Spain extensively as a solo dancer and frequently appears as a featured dancer at Granada’s famous flamenco venue, Venta El Gallo, which overlooks the Alhambra. Alejandro Luján was born into a family of flamenco singers in Granada, Spain. At eight he began studying with some of the great masters of flamenco singing, including Luis el Zambo, Arcángel, and El Pele. He has performed on local and regional television programs and regularly appears as a featured singer at Granada’s legendary flamenco venue, Venta El Gallo, overlooking the Alhambra. For $100 ($90 for Friends) enjoy all three events plus complimentary Museum admission and a three-day parking pass. The Aga Khan Museum in Toronto, Canada, has been established and developed by the Aga Khan Trust for Culture (AKTC), which is an agency of the Aga Khan Development Network (AKDN). The Museum’s mission is to foster a greater understanding and appreciation of the contribution that Muslim civilizations have made to world heritage while often reflecting, through both its permanent and temporary exhibitions, how cultures connect with one another. Designed by architect Fumihiko Maki, the Museum shares a 6.8-hectare site with Toronto’s Ismaili Centre, which was designed by architect Charles Correa. The surrounding landscaped park was designed by landscape architect Vladimir Djurovic.